A low, indistinct and continuous sound, murmuring evokes the telling of stories or rumours that conjure powerful mental pictures. Murmuring otherwise connotes an endless babble of visual and verbal information - the point where language fails and meaning collapses. Underscoring mechanisms of verbal imagination and visual enactment, linguistic rupture and the dissolution of the image, murmur explores fiction-making as a means by which to critically reorder the data of experience, frameworks of memory and limits of perception. The artists in the exhibition have mined sources ranging from folklore and literature, to history and cultural theory, selectively reiterating and placing ownership over information, language and images that otherwise slip into an anonymous stream of murmuring. The artworks raise enquiries on existing social narratives, rationalities and systems of belief as the artists attempt to spin new fables from borrowed plots by deploying fiction as an evaluative strategy; a blank space from which to recall, to speak and to perform. Featuring newly commissioned titles and works previously not shown in the UK, the project brings together video, installation and sculpture works by Anita di Bianco (US/DE), Aoife Collins (IE), Trong G. Nguyen (US), Kate Pickering (UK), Erika Tan (UK/SG), TinTin Wulia (ID) and live performances by Lynn Lu (UK/SG) and Matthew MacKisack (UK) due to take place on the First Thursday of December. The artist Erika Tan and curator Eliza Tan discuss the notion of ‘foreignness’ and the indeterminacies of identity as constructs of visual and verbal languages, questioning the extent to which cultural experiences are shaped by pre-defined values, myths and assumptions. Appropriation ‘Appropriation’ refers to the act of ‘taking for oneself’, or ‘taking possession of’. In many instances, the strategy has also lent itself to abuse. Lazy art always seeks a famous alibi. Contemporary practices of cultural quotation motion toward a self-conscious recognition of collective authorship and a disavowal of originary claims on one hand. On the other, an impulse to escape anonymity, to be heard and to successfully lodge one’s voice amongst voices of the murmuring multitude continues to be the driving force of cultural production. Boyd, William Boyd’s Beulah Berlin, an A-Z must be credited here for how this glossary is taking shape. I remember reading the short story in a non-descript Thai takeaway located at the U/S-Bahn station along Alexanderplatz as I waited for my plate of green curry. I forget the name of the joint – I blame the coconut-milk and bamboo shoot overkill for my trauma. Angst, ennui, weltscherz, cafard, taedium vitae, anomie…Curious how oddly beguiling these words are. I almost don’t mind suffering from the conditions they describe. Some of the so-called ‘beautiful diseases’, perhaps. But I exaggerate: for most of my life everything was normal – I only realized I was in trouble when I went to Berlin. 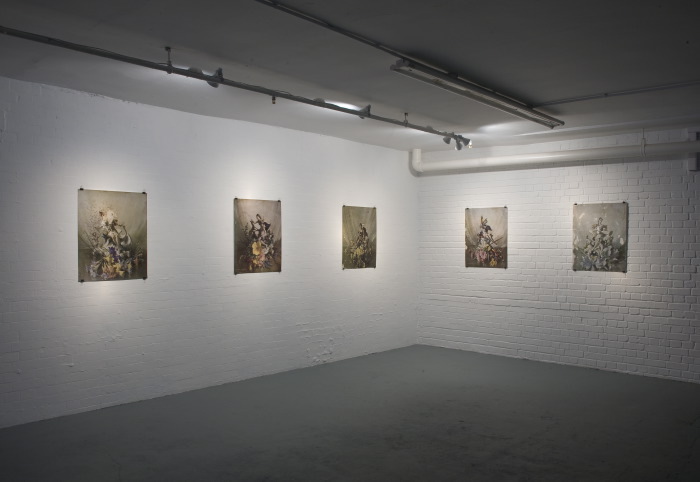 Collins, Aoife Aoife Collins’ Mangetout (2009-10) comprises appropriated images of a set of tablemats that, while depicting a Victorian aesthetic, were made much later and bear a soft-kitsch quality. Found in various states of ruin, the images feature tears, stains and mould that have developed on the mats over time, in place of ‘painterly’ gestures. Where these mats would otherwise be placed horizontally, on the flat surface of a table around which one would imagine a party of five, they now hang on a gallery wall. (You’re Gonna) Hurt Yourself (2010) features yard sculptures resembling Victorian statuettes, now decorative ‘kitsch’ objects. 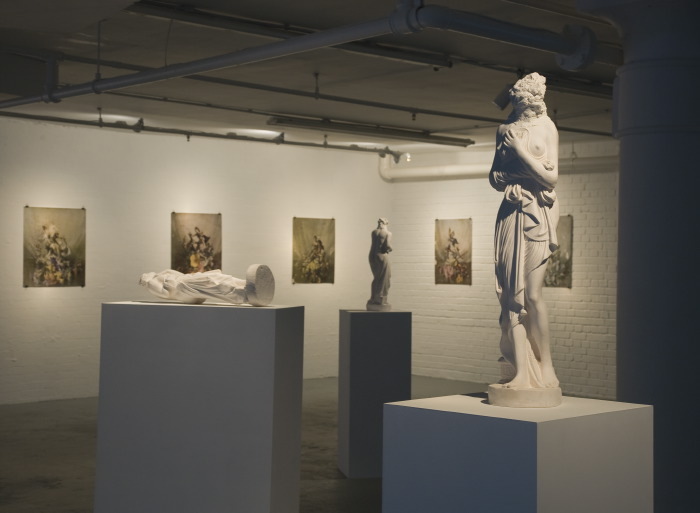 While the work is a humorous pun on how this aesthetic ought to be ‘executed’, the removal of the statue’s heads also parodies Georges Bataille’s notion of informe or ‘formlessness’, recouperating his narratives on ‘horizontality’ and a base perspective as opposed to the fetish of form deriving from a vertical, organising principle in art. Other art historical narratives and precedent texts informing the work include Clement Greenberg’s iconic 1939 essay On Avant-garde and Kitsch and Leo Steinberg’s 1972 The Flat Bed Picture Plane which carries over from the breakdown of a Renaissance worldview. Considering the shifting function of the readymade art object and its mass-produced counterpart, Collins’ works morph between meanings and values, formal languages in art and their mutability. Di Bianco, Anita Anita di Bianco’s Dreaming and Drugs (2007) breathes new interpretive life and imaginative movement into a 1980 interview with novelist Marguerite Yourcenar. 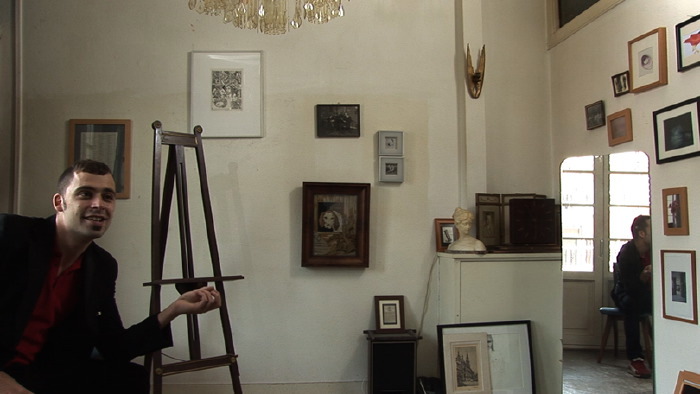 Actor Jean Baptiste Naudy assumes Yourcenar’s voice, expressively performing her articulations on academicism, history and the imagination, the diagrammatic architecture of dreams and dream aesthetics, as well as the consciousness that writers form in relation to their ‘living’ characters. Mediating between the writer’s text, actor’s interpretation and its transposition into the medium of expanded cinema, di Bianco’s video piece seductively commands a viewer’s full immersion in the movement of living language and its imprint in space. Exhibition murmur explores possibilities of re-imaginatively possessing and actively evaluating a murmuring stream of existing visual and verbal languages in and through the language of fiction. The game of appropriation in contemporary art, by extension, continues to be haunted by a similar tension underlying Foucault’s ambivalent statement. Make-believe features as one of five social principles for the contextualization of an event in memory where ‘actors step into a fictitious space’, such as in games of historical re-construction. Images and the Imaginary Images, alongside words, exist on an equal plane of consciousness. With images and words, we have given form and expression to topographies of knowledge, genealogies of ideas and systems of belief. Visual and verbal narratives function as vehicles by which to communicate shared modes of existence and subjective states of being and becoming. Every new narrative is preceded by a multitude of former languages and vocabularies. Fiction, the space of the imaginary, provides an outlet through which language can return in a coherent form. Kabakov’s practice speaks back to notions of Utopias by recovering biography as fiction, and fiction as biography. The dream of communism, in this case, depicted by the (failed) example of the Soviet Union, is situated within the same graphic field as that of the project of capitalism. Lu, Lynn Lynn Lu’s work gestures towards the connection between the public and private realms of experience and knowledge, empathy and intimacy. Experiments in social and relational exchange, her performances underscore bodily languages relayed between herself and her audiences. Lu’s piece for murmur picks up on the imagery and metaphorical connotations of the act of spinning. Recalling ‘spinner’ tales such as that of Rumpelstiltskin and the Miller’s Daughter who spun gold out of straw, or the myth of Arachne and Athena, Lu’s participatory performance investigates spaces of collective and subjective memory. MacKisack, Matthew Matthew MacKisack’s lecture performance The Incoherence of the Incoherence (2010) played by Jeffrey Gordon Baker, translates and restages a paper presented at the l’École biblique et archéologique française de Jérusalem in 1969. It describes an attempt to excavate the Biblical tomb of Lazarus, the failure to do so in the face of problems such as imaginary additions to ancient topographies, and a subsequent turn to aerial photography as an alternative to excavation. The video begins and ends in Derby Museum and with Joseph Wright’s A Philosopher Lecturing on an Orrery, and also features re-created slides used during the lecture. The work queries disjunctions between ‘faith’ narratives and the empirical analysis of ‘fact’, the manifestation of ‘signs’ and miracles, and a corresponding search for scientific, archeological and anthropological evidence. Nguyen, Trong G. Trong G. Nguyen’s Library (2007-) is an ongoing work comprising rice kernels on which the complete 48 chapters of Roland Barthes’ La chambre Claire (Camera Lucida, 1980) have been inked in blue, word for word on each grain, some gilded in gold leafing. Presented in Mylar packets made after the New York Library’s borrowing ticket, the work depicts date stamps alluding to the time and labour invested in the piece. Clock Radio (2007-) renders a parallel poetic, whereby the station on the radio is tuned to the repetitive voices of three different persons enunciating the day’s seconds, minutes and hours, making for a subtle yet sonorous experience of our consumption of time through visual and auditory faculties, as well as within existential and immaterial realms. 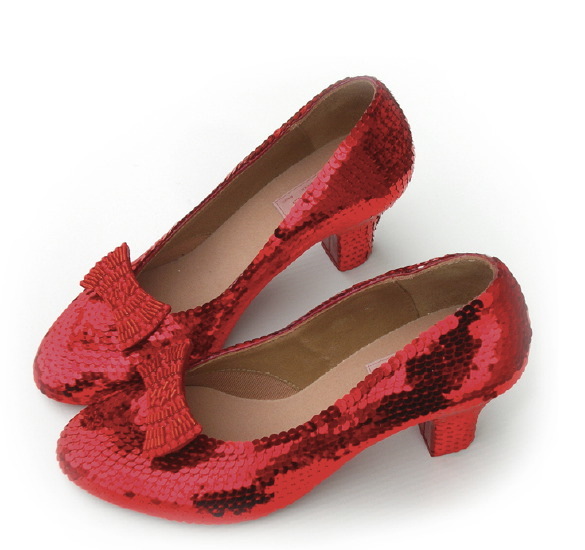 Oz Slippers (1998-) recalls Salman Rushdie’s At the Auction of the Red Ruby Slippers, where the winning bidder for Dorothy’s shoes inherits a genie able to transport its owner anywhere upon three clicks of the heel and the incantation: ‘There’s no place like home.’ The concept of ‘home’, however, in an age of globalisation, expanding borders, virtual territories and shifting forms of cultural migration, is fraught with uncertainty. ‘There were no poor people in the land of Oz, because there was no such thing as money… Each person was given freely by his neighbours whatever he required for his use, which is as much as anyone may reasonably desire. Pickering, Kate Kate Pickering’s site-specific intervention I TELL YOU THE TRUTH (2010) stands as a partial blockage at the entrance/exit point of the exhibition. Bearing religious overtones and alluding otherwise to the relationship between art, convictions and beliefs, the letters of the statement ‘I TELL YOU THE TRUTH’ come across as an open manifesto, a prophecy, a commandment, and abstract claim all at once. The semantic value of language is broken down here, as it takes the literal form of a structural object comprising a sequential arrangement of exaggerated signs. Imposing itself on the viewer, who must negotiate his way around the construct, the work interrupts the equally constructed paces of the exhibition’s spatial narrative, raising questions on the proportions of art and language as systems, and the circularity of such systems. Quotidian Everyday life is steeped in its own fictions, fictions generated to break the general malaise of quotidian boredom. Fictions promising a better life in HD flood the glossy pages of magazines, advertising billboards, television and cinema. Or, everyday fictions, popular myths pertaining to places and people, to pasts and futures – fictions that offer foreignness as a novelty and ‘otherness’ as the experience of newness, fictions which influence one’s worldview as a matter of myth or rumour, fact or opinion. Repetition It is less a question of why we repeat, and murmur away, than it is how we repeat with all the nuances of difference that may emerge from the murmuring. Slowness An experience of fiction requires slowness, a commitment to sit with a work of art or text to picture its given content and extrapolate its potential meanings. Slowness pertains also to global artistic flows and the ‘murmuring multitude’ of art, artists and exhibitions as such exchanges expand across borders at the speed of globalisation. The co-existence of local spaces of intimacy and ‘slowability’ alongside its expansion, movement and absorption within global networks and vice versa allows opportunities for individual appropriation and for sustaining art within a ‘free zone’. 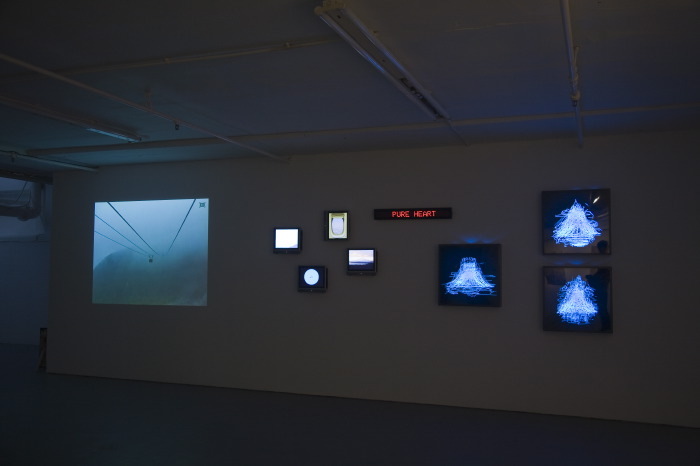 Tan, Erika Erika Tan’s The Syntactical Impossibility of Approaching with a Pure Heart (2008) was conceived around an attempt to view Japan’s most iconic attraction: Mount Fuji. The title refers in part to local Shinto beliefs. A torii (a traditional Japanese gate commonly located at the entrance of a shrine) along the path to Mount Fuji serves as a symbolic marker of the transition from profane to sacred ground, reminding pilgrims to cleanse their inner selves and approach the peak with a pure heart. 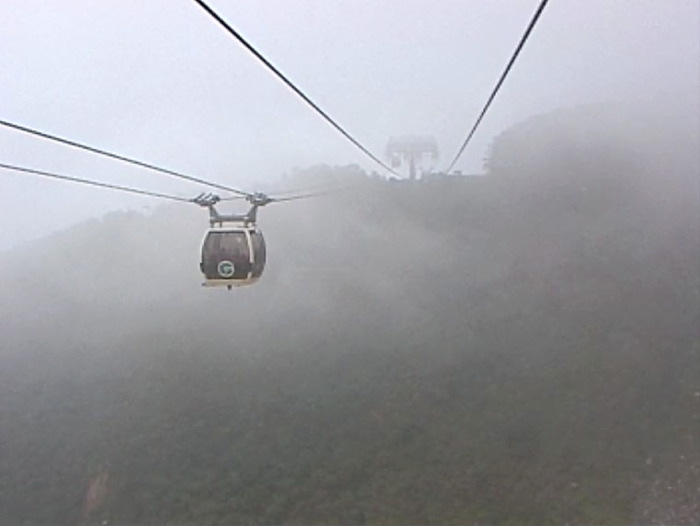 Beset by various obstacles such as bad weather conditions and poor visibility, the trip is never realized. In place of this ‘failed’ attempt, Tan’s installation presents a spread of Mount Fuji images both new and found within public domains, creating a small archive of Japan’s best known symbol as it continues to amass a visual vocabulary of its own. The work explores the assumptions that travellers carry with them, as well as the physical, imagistic and psychological mechanisms that perpetuate certain perceptions of a culture. The extent to which we can readily assimilate, ‘import’ or subjectively re-calibrate the perceived rules of engaging a particular culture in relation to our own experiences and ways of seeing comes into question. How do we situate an experience or our imagination of a foreign place or culture within our individual narratives? Is our experience of ‘foreignness’ a constructed language woven out of inherited systems of definition? Urtext There is perhaps no such object as the ‘urtext’, an original form of text or composition, if all language derives from a precedent source and if all narratives are influenced by precedent ideas. Verbatim To repeat something word for word, in verbatim, is to replicate and reproduce a semblance of authenticity. It would be useless to murmur something in verbatim without injecting nuances into its meaning or straying from it - for example quoting but making further comment, expanding on the former content or disagreeing with it, quoting but productively misreading a text in the process of interpretation, quoting but re-contextualising its content for different means and to different ends. Wulia, Tintin Tintin Wulia’s experimental documentary Ketok (2002) draws out the poetics of history and the impossibility of reconstructing a full image of the past on the sole basis of documentary traces. In the video, Wulia’s parents recount how they had once humorously mistaken the sound of a gecko, a tropical lizard traditionally believed to bring good luck, for that of someone knocking at their door. While relayed with all the charm of a child animating a story in her imagination, a haunting political spectre looms over the work, pointing to a traumatic silence enshrouding General Soeharto’s violent anti-communist purges in Indonesia beginning in 1965, the year Wulia’s grandfather was forcefully detained and never seen again. Photographs flash elusively across the video like traces of memory denied, motioning towards the impulse to give voice and form to a repressed reality. Masked disjunctions between absence and presence, silence and loss, float to a resistant surface. The function of ‘speaking in order to remember’ in personal and collective terms weighs heavily against the failure of fiction and the imagination to mediate between reality and remembrance, questioning if one speaks to remember, in order to forget what cannot be forgotten. Fiction, by extension, generates further fictions. The work of art presents a structurally open narrative, or matrix of potential meanings, that the active observer must commit to interpreting by stepping into an imaginary, interstitial space. Likewise, the words of a short story evoke images in the mind’s eye of its reader, who experiences its narrative content in a participatory act of fictionalization. Youthphoria ‘Murmuring’ refers not only to a visual, verbal and auditory buzz of meanings and information. It relates also to the nature of contemporary art production and consumption. Zwischenzug The ‘intermediate move’ where a chess player poses a counter, rather than expected move, to which an opponent must first answer. The applied language of fiction in a work of art or writing is an intermediate strategy of mediation that questions any underlying assumptions of a work’s self-enclosed meaning and authorial power. Fiction advances from within marginal, over-imagined and yet un-imagined territories. Anita Di Bianco’s videos take up, modify and re-work existing and re-imagined literary / film characters, as well as re-visit familiar media rituals and pop-cultural tropes. Her work involves the imitative act, a taste for the possession and expulsion of narratives, the appropriation of familiar texts and writing styles, using widely varying kinds of sources. Aoife Collins’s interdisciplinary practice explores the transience and mutability of objects, ideas and public personas, especially the filtering down from ‘highbrow’ to popular culture and the inherent changes of form and meaning that occur in these circumstances. Trong Gia Nguyen’s works contend with power relationships between viewer and art object. Traditionally this dynamic favored the viewer, who determines the criteria for assessing a work - how long to look at it, under what formal qualities, and so on. By manipulating the ‘looking act’ itself and inverting this gaze, Nguyen reclaims control. Kate Pickering’s work arises from the marginal position of an artist who is also religious. She uses this counter-cultural position to address the beliefs and disbelief, exploring how the language of religion might be used to both examine and undo art world norms and assumptions. Pickering’s work makes explicit the multiple and contradictory ideas about what might be acceptable art, turning them into a list of commandment-like rules. 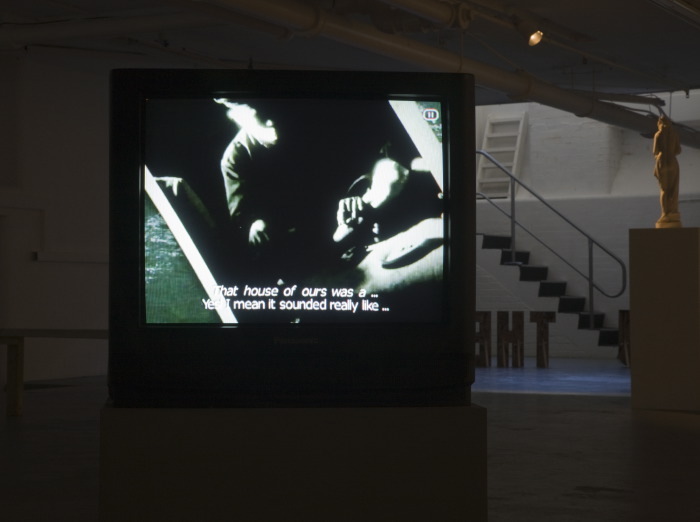 Erika Tan’s work has evolved from an interest in anthropology and the moving image. 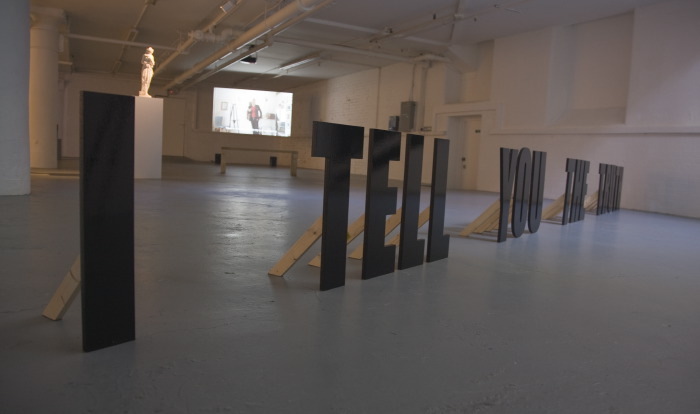 Her work is often informed by specific cultural, geographical or physical contexts; exploring different media to create situations that excite, provoke, question, confront and invite comments from the audience. Tintin Wulia’s artistic practice is informed by critical geopolitics. She examines the physical-spatial nature of borders; the relationship between citizenship, mobility, and political power. Her work takes form in video, mural and 3-dimensional objects, and communicated through installations and interactive performances. Mariza Tschali, Emma Seaman, Andrew Yau, Rehana Begum, Guido Barbato, Hana Moskovic, Crown Paints, Axis Communications. We gratefully acknowledge the support of Mr James Ellery and Wonder.